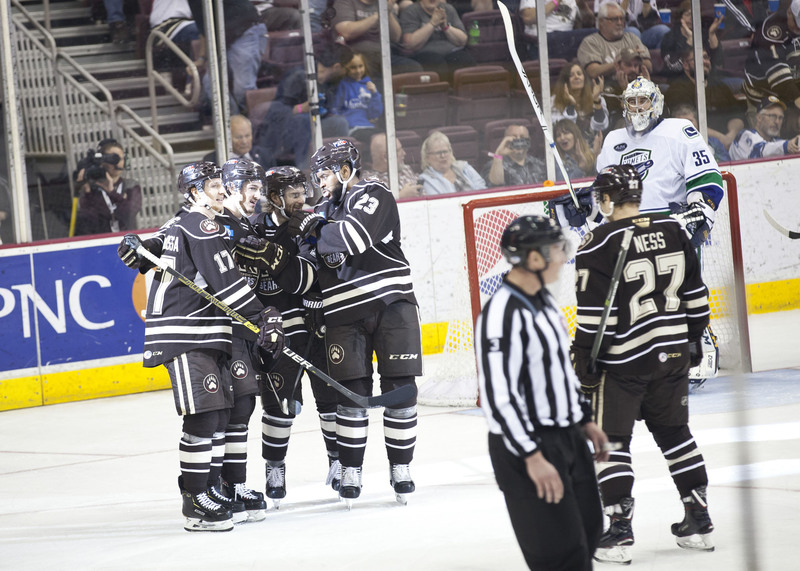 The Hershey Bears downed the Utica Comets 4-1 Saturday night at the Giant Center in Hershey. The win improves the Bears record to 42-25-4-4 (92 points) on the season. The Bears wrap-up their regular season schedule on Sunday when they host the Hartford Wolf Pack at Giant Center. Puck drop is set for 5:00 PM. Scratches: Kris Bindulis (upper body), Garrett Pilon (lower body) and Riley Barber (upper body) were the injury scratches. Hampus Gustaffson and Tobias Geisser were the healthy scratches. Suspended: Liam O’Brien was given a three-game suspension for his charging call in yesterdays game against Hartford. He will miss tomorrows regular season finale, in addition to the first game of the playoffs. Call-ups: Ilya Samsonov was recalled by the Capitals on Thursday April 11th. As a result, Adam Morrison was recalled from the Carolina Sting Rays. The Bears would start the scoring with a wide-angle goal from Nathan Walker at 14:32 of the first period. Lucas Johansen (11) and Devante Smith-Pelly (8) had the helpers. The first period would end with the Bears holding a 1-0 lead. The Bears outshot the Comets 10-9 for the first 20 minutes. Both teams were 0 for 1 on the power play in the first period. The Comets would tie the game with a close-range snipe from Kole Lind at 6:48 of the second period. The Bears would turn the puck over behind their own goal. Lind would receive a pass, walk out in front of the Bears goal and snap one for the tie. But the Bears would quickly respond. Jayson Megna would score his 20th goal of the season on the power play at 8:03 of the second period. Mike Sgarbossa (35) and Aaron Ness (49) had the assists. The second period would end with the Bears hanging on to a 2-1 lead. The Comets outshot the Bears 15-9 for the middle frame. The Bears would stretch their lead to 3-1 with a goal from Shane Gersich at 10:44 of the final frame. The goal was Gersich’s 8th of the season. Aaron Ness (50) and Chris McCarthy (1) were credited with the helpers. Lucas Johansen would pot an empty netter for the 4-1 final. Three stars: 1) Vitek Vanecek, 2) Aaron ness and 3) Jayson Megna. The Bears outshot the Comets 32-26. Vitek Vanecek stopped 31 of 32 shots for a .969 game save percentage. Jayson Megna led the Bears in shots with 4. The Comets were 0 for 5 and the Bears 1 for 2 on the power play. The AHL box score for the game is here. Game 1-Friday, Apr. 19 at Bridgeport, Webster Bank Arena, 7 p.m.
Game 2-Saturday, Apr. 20 at Bridgeport, Webster Bank Arena, 7 p.m.
Game 3-Tuesday, Apr. 23 vs Bridgeport, Giant Center, 7 p.m.
Game 4-Thursday, Apr. 25 vs Bridgeport, Giant Center, 7 p.m.
Game 5-Saturday, Apr. 27 at Bridgeport, Webster Bank Arena, 7 p.m.
Another game, another solo lap! Have yourself a debut, Bobby Nardella (@bnardella_7)! This entry was posted in News and tagged Hershey Bears, Jayson Megna, Jon Sorensen, Nathan Walker, Shane Gersich, Utica Comets. Bookmark the permalink.